You are here: Home / motivation / Thanks for the Motivation, Uncle Jerry! These are the words I heard come out of my uncle’s mouth as he reached his hand into a bowl full of potato chips and tipped back his Miller Lite™ beer. “What kind of advice can you give me?” Uncle Jerry said in a muffled voice with his mouth full of chips crumbling all over his lap. I sighed. Paused. And then it all came pouring out. “Well, Uncle Jerry, in my opinion, you can’t afford NOT to make the time to exercise. “And it’s not just about weight loss; it’s about something much, much, more powerful. Of course, weight loss is all a part of this journey, and we get healthier…and we become more productive, too. But it’s not just about looking great when we look in the mirror naked. “It’s a philosophy and lifestyle that most people will simply never understand. “It’s about being part of the club. The 2% club. 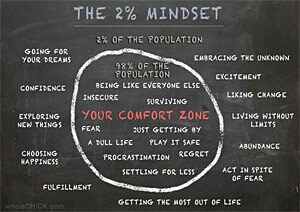 “98% of the population lives in the comfort zone. Only 2% are consistently taking their health, vitality, and well-being serious. “And many times, Uncle Jerry, it’s the people like you who motivate us to be 2%ers. “We love it when you talk about not having time to exercise. You’re our shot in the arm. Our motivation and wake-up call. “You see, we’re too busy to exercise, too, but we do it anyway. “And yes, we’re too busy to prepare healthy meals and eat them, but we do it anyway. “Even though we have average genetics and we don’t always feel like exercising or eating healthy, we try our best to do it anyway. “Many of us used to be just like you, Uncle Jerry, but we did it anyway. “We overcome all the B.S. excuses and we just do it anyway. WE DO IT ANYWAY because we’re 2%ers. I’m sure you know, just like we do, that making healthy eating and exercise part of your life is NEVER pleasant in the beginning. I know there are many, many times throughout the year when Karen and I slack off. We’ll gain ugly fat in undesirable areas just like YOU (and everybody else). But we get up the next day, dust off our failures, and get right back at it! 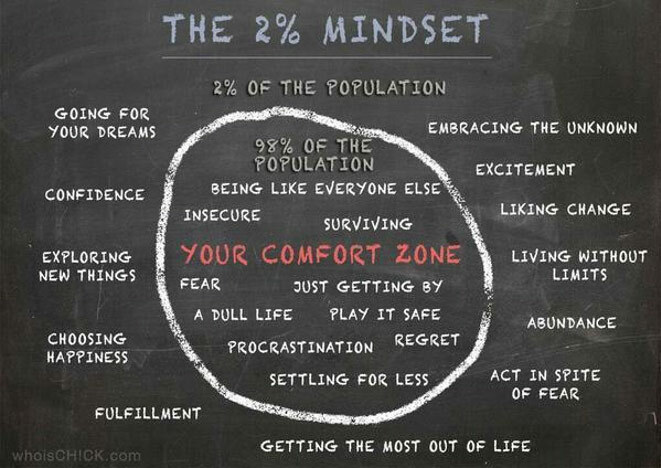 Remember: YOU ARE A 2%er! Dwelling on your mistakes or inconsistencies is reserved for the negative Uncle Jerry’s of the world, BUT NOT US. Hey, NONE of us are perfect and we’ll all fall off track. But since we’re part of the 2% Club we strive to be consistent. And that’s what separates us from guys like Uncle Jerry. We eliminate excuses and strive for consistency (NOT perfection) day after day, week and after week. If you’d like to take this to a deeper level, click on and then print out this diagram below, which perfectly illustrates the 2%er mindset, and put it on your fridge.